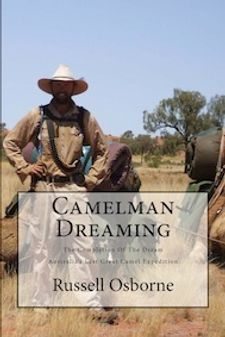 Outback Australian Camels, Russell Osborne's book Camelman Dreaming. 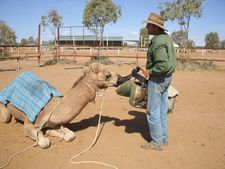 Australia's Premier Camel Safaris and Training. The story of Robyn Davidson's book and epic adventure, Tracks is now a major feature movie. Crossing the deserts fro Alice Springs to the West Coast Of Australia in the late seventies, Robyn set her sights on a goal that many others thought was impossible. To her, there was no doubt that the journey was possible. 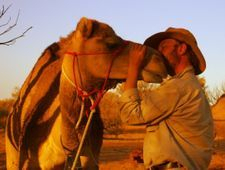 Camel expeditions such as Robyn's are born from a simple decision. The decision to do something! Once made, there is nothing that will get in the way of the dedicated dreamer. Having spent thirteen years to plan the Darwin to Melbourne Thank You Camel Expedition 2008-2009, Russell Osborne, CEO of Outback Australian Camels knows exactly of the determination Robyn and others like her have required to complete such a mammoth task. His journey was in the name of charity and following this trek, he has developed the world only Camel Expedition Course, designed to teach the skills required to undertake such a journey. As he say's, he doesn't want others to have to make all of the mistakes he made which cost him both time and money in getting his expedition off the ground. Do you have dreams of completing a camel expedition or trek of your own?